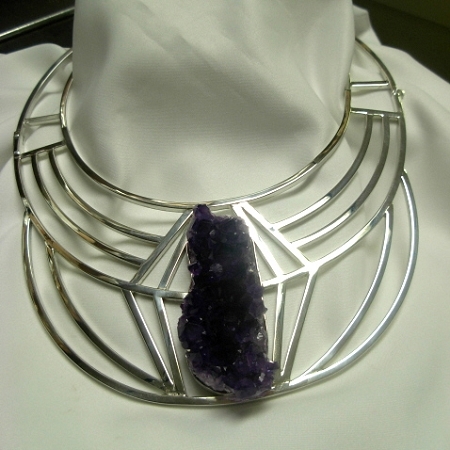 Art Deco Jewelry - This is a handcrafted bold artistic sterling silver statement collar that is constructed from square tubing soldered together and features a beautiful large geode crystal purple Amethyst. This choker was in the Cincinnati Magazine. A One of a Kind Sterling Silver art deco collar accented by a natural geode amethyst. Each geometric silver shape is soldered separately. This is a one of a kind necklace for the collector. This choker was featured in The Cincinnati Magazine and is hand fabricated. This statement necklace is signed and created by Aaron Rubinstein and Modern Art Jewelry.